The Philippian Jailer: Facebook Evangelism ... or "Keep Christ in Christmas, You Heathen Swine!" Facebook Evangelism ... or "Keep Christ in Christmas, You Heathen Swine!" Last week I found myself in an office at work where a particularly haughty woman was castigating a co-worker for wishing her a "Merry X-mas". You know the drill from here: "Jesus is the reason for the season", "they can take Christ out of Christmas but they can't take Christ out of me", etc., complete with contemptuous sneer and wagging index finger. Billy Bob believes in Jesus Christ and is proud to say it! Let's see how many people on Facebook aren't afraid to show their love for our heavenly Father and Jesus Christ our Savior! Repost this as your status. Let's get God back in this country like He should be! If you agree...post this as your status update. Just copy and paste. Facebook appears to have replaced the bumper sticker as the place where Christians succumb to the temptation to "boldness". Yet, if my primary concern is that the world is dying without Christ, will they be saved because I brazenly copy and paste my outrage to Facebook? Will they be reached when our culture rejects expressions of "Happy Holidays" and re-accepts Nativity scenes in the town square? Or will they be reached when Christians heed Paul's instruction to "Be wise in the way you act toward outsiders; make the most of every opportunity. Let your conversation be always full of grace, seasoned with salt ..."
If indeed "I am not ashamed of the gospel" and am ready to prove it by a public, glib display of self-righteous arrogance, maybe a little more shame is called for. I take your point. Anything not motivated by sincere love for God and for people can be mis-used or mis-applied. I love zeal, but we must temper it with grace, as your scripture quote above commands. Also, how do you deal with Philippians 1:18? With respect to Philippians 1:18, I suppose I would say that I too rejoice in the preaching of Christ, but I question whether the "boldness" of some is in fact preaching, or merely yelling. As for my methods, I will confess to taking some liberties within "the family", as in using irony and a little humor to draw attention a particular point. I'm sorry if any find that offensive, but my motive is to draw attention to what I perceive to be a growing trend toward ineffective sloganeering, thereby undermining the message of the gospel. No doubt, screaming "go to church" from the back of a pickup is not going into all the world and preaching the gospel! Great zeal - poor message. Zeal for God without knowledge can be a real problem, and can do more damage than good, thats for sure. Just be careful when judging what is effective and what is ineffective. All believers are called to be witnesses (Acts 1:8)), and we are not all going to witness in the exact same way. We as individuals tend to judge others by how they line-up with how we see things, do things, etc. But God is doing things behind the scenes that we just can't see. I've experienced it in my ministry. 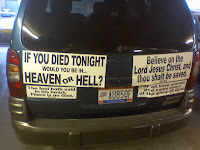 Some may scoff at a big Jesus magnetic bumper sticker on the back of a minivan, but God may indeed use this as one step in bringing a lost person to saving faith. Or, a street preacher proclaiming the gospel may challenge another brother to be a little bolder in their own witness, maybe actually go share the good news with their neighbor, and point them to Jesus Christ. No offense taken by me. Apollos "was fervent in the spirit" (i.e. he had a lot of zeal), but Aquilla and Pricilla "expounded unto him the way of God more perfectly" (he needed to straightened out on some things). My point here is that they didn't throw him under the bus: they helped him, and God used him mightily. It sounds like thats what you did for the youth group kids, and its what we all should be doing with the Billy Bobs of the world. Praise God for their love for the Lord, love enough to swim against the tide of this world and attempt to be light and salt. What we may laugh or scoff at in this world as being ineffective may surprise us in eternity. Thanks for taking the comments. I appreciate your comments and share your concern about making too much of "Happy Holidays" greetings. I wrote about it on my blog, as well, last month. Posting a Facebook challenge as you described is just another version of the e-mail challenge, "If you love Jesus, you'll send this message to everyone in your address book." I guess that if I don't follow those instructions, I'm just another God-hater who spits at the foot of the cross.